The following information is related specifically to our CVS models of turntables, however, much applies to turntables in general. 1. Is there equal sound produced by both channels? The following would tell us that the switch is basically connected correctly internally. 2. Set you amplifier to play "MONO". If your amplifier does not have a MONO switch, use a "Y" connector to connect the two RCA output cables together, and connect that to either L or R phono input of your amplifier. Yes connect the ground wire as you normally would. 3. Play a mono record. Here is how to check if under deck ground connection from the arm to the outputs are connected. 1. You will need a wire that has metal contact at both ends. For instance, any RCA cable. You will use the center connector of one end and the center connector on the other end (if stereo cable, one channel only). 2. Take notice of the volume of the hum. 3. Now touch one end of the wire to a bright shinny metal part of the arm tube, and touch the other end to the ground terminal or a shinny metal part of your amplifier. 4. If the hum goes away. The is a bad ground connection in the turntable or possibly a bad crimp connection at the turntable's output ground wire right at your amplifier. 1) You should have the phono pickup cartridge mounted in its headshell, and that mounted on the arm as for normal use. 2) Use an Ohmmeter and measure the resistance across each output lead. That is from the RCA plug center prong to its outer ring. This requires a little manipulation of the test leads. You should expect to measure 200 to 600 Ohms. If much greater, like 10,000 Ohms, there is an open circuit somewhere as explained below. A sensitive continuity checker might be used and you would hope to see good continuity. 3) Operate the Vertical/Stereo switch. The resistance (continuity) should not change. 1) Try substituting a known-good cartridge/headshell. Maybe you can borrow one. If it works, then the problem is with yours. 2) Film on the rear arm connectors can cause an intermittency. Remove the headshell, and rub the rear-end connectors on a piece of clean cloth for about 10 seconds. Replace the headshell and check sound. With stubborn cases, you may have to get a long bristled brush (stiff if possible) and some alcohol and clean the arm's recessed connector. 3) If a new install, check the leads going to the cartridge. People frequently make a mistake here. 4) Headshell leads can become intermittent. They are usually crimped leads. Try wiggling each to see if that restores connection. 1. The cartridge may possibly be wired wrong. Check that the leads in the headshell are going to the correct pins on the cartridge. 2) Again very rarely, but it has happened, there is a film or some contaminant, who knows, that is on the 4 little pints at the back of the headshell. Try removing the headshell and just rubbing the pints on a piece of cloth a few times to clean them and replace the headshell. 3) The leads in the headshell are crimped on. Very rarely, but it has happened over the years, a crimp looked good, but there was no real connection. Just giving them a wiggle could restore connection. If another known-good cartridge/headshell is available, try it with the suspect turntable. 4) Last resort check to see if the problem is internal or not: This uses your body as signal source. Take a small screwdriver and hold the blade by the metal, or hold a paper clip or wire. Then with the amplifier volume somewhat low, probe and touch cartridge R and L pins; they are Red and White. You should hear a buzz out of the respective speakers. Be sure to keep the amplifier volume at a level that is not too loud. 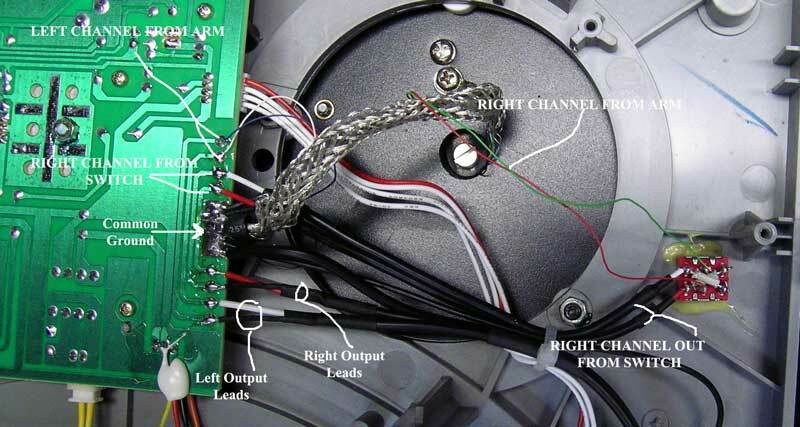 With a good condition turntable wiring, you will hear a buzz from the L and R speakers when you touch the L and the R pins. If only one produces a buzz, the problem could be internal. 5) The turntable's output cable connector may not be making good connection at the amplifier. Remove and replace cable from amplifier. If one channel still out, reverse R & L cable and replug in. If the problem channel is now reversed, then the problem is probably inside the turntable or the cable is bad. 6) Check to see if the Vertical/Lateral Switch makes a difference. If the dead channel comes back in one position or another, then the switch wiring or the switch itself could be at fault. Analysis/repair requires removal of the bottom cover. To do this, remove the platter, and lay the deck, upside-down and a soft surface, like a pad of sponge rubber, pillow, or a few thick towels. When you remove the Philips head screws, you may notice that here is a little sleeve on them. If you don't see the sleeves, that is because they are still in the holes. The best way to retrieve them is with tweezers. If you don't, they will fall all over when you pull the cover off. The easiest to fix problems are bad solder connections that popped off the wiring from the printed wiring board to the Vertical Lateral Switch and associate output cable. 8) Also, check to see if a cable from the switch to the PCB has popped off. 9) check to see if there is a solder short between adjacent pins at the switch. To resolder or clear solder shorts, requires a small soldering iron that is normally used for electronics work. A large one used for plumbing could cause a mess. The cables are "tack soldered," and all you need to do is hold the wire at the proper PCB wiring pad and just tack it down with the soldering iron tip. Nowadays there are often mixtures of English and of Metric connector parts. The simple RCA connectors can sometimes look connected, but are not. To explain. Sometimes, the diameter of the shield connection of an RCA connector may actually be a minute fraction of a mm larger than the ring of the jack into which you are plugging. You will feel normal resistance when pushing it in, but what you are feeling may simply be that of the center post connecting. The shield may actually be held by that center post directly in the middle and the shields are apart by that minute fraction of a mm. The fix is to pull the plug out and squeeze the connector's shield. You may have to use pliers to make that circle a tad oval. Then, when you plug it in, it will definitely make a good ground connection. If after checking things out, you find that the problems is internal, and you are skeptical about repairing it yourself, seek professional help.